It is the smallest things that bring redemption. 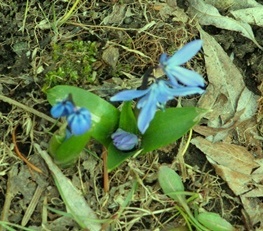 The tiny blue flowers have pushed through the cold soil to grab the gleam of sunlight, a lure of warmth that turns them toward life; they have been here before, one, then five, then a dozen, soon a carpet of blue flowers wrapped in green leaves, rising from the grey debris of the autumn, the brownness of a past season, bright, but temporary. The river below churns dark and furious through the shaded canyon, foaming and alive with fresh run-off. Eddies form as the green water swirls against the cribs of long-ago lumbermen, their great enterprise reduced to a scattering of wooden diamonds in a fast-flowing river. Below, the stiff straw hides the green shoots of new grass and on the maples, red small bulbs swell and darken, waiting the warm touch that brings release. There has been too much silence, too much suspicion. Your eyes, once bright with mischief, are darker, uncertain. There is distance where none should be; distrust, like frost. The sun, intense and still angled low in the eastern sky should turn your hair golden, translucent as the finest light, your face full of wonder. Your soul should be calm and sure, yet it is not; your heart should be full, yet it aches. We have been here before, staring across these disagreements, been here before with questioning eyes, unsure what words open again the world. Maybe it is not words. Maybe it is not thought or reason or folded arms of defiance, hands wrung in anguish, not looking inward, not sheltering the hurt. Maybe it is touch; maybe it is the memory of your sweet grin from across the room as you rolled your eyes in humor at the possibilities, things we know now never happened. But cold and darkness fade. Light rises and sweeps across the sky; love remains. This entry was posted in Fiction and tagged forgiveness, love, Spring. Bookmark the permalink.